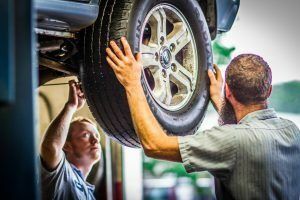 Auto repair and maintenance is rarely on the top of anybody’s to­do­list but there are time when it is necessary to have a maintenance service or repair performed on your vehicle. When that time comes, consider bringing your car, truck or SUV to Konen’s Pittstop. We have been in the community for years and we are family owned. Come see the difference our independent auto repair shop can make to your automotive repair and maintenance experience. We pride ourselves on being able to quickly diagnose and repair any issue you may be experiencing with your vehicle. No matter if it is foreign, domestic, big or small we can repair it all. The reason our shop is so different is because repairing vehicles is our passion. Rob, the owner, has been working on cars ever since he was old enough to earn money mowing lawns. He quickly turned his hobby into a career and now he is able to provide the citizens of Bellevue Kentucky with quality auto repair and maintenance services. We know how much you depend on your car on a daily basis. That's why we look forward to performing the quick oil change you need or maybe it's having that check engine light diagnosed. Here at, Konen's Pittstop we can quickly and efficiently diagnose any drivability issues you may be experiencing out on the road. We also want to give you the peace of mind you are looking for when having your vehicle serviced by one of our professional technicians and that's why we offer a 3 Year / 30,000 Mile Warranty on most parts and repairs. So when you feel that your car pulls to the left or right when you are attempting to drive straight or you feel excessive vibrations at higher speeds, drive on into our shop and we'll be happy to help with all your automotive needs no matter if they're big or small. Give us a call, swing on by or conveniently schedule an appointment for a day and time that works best for you!